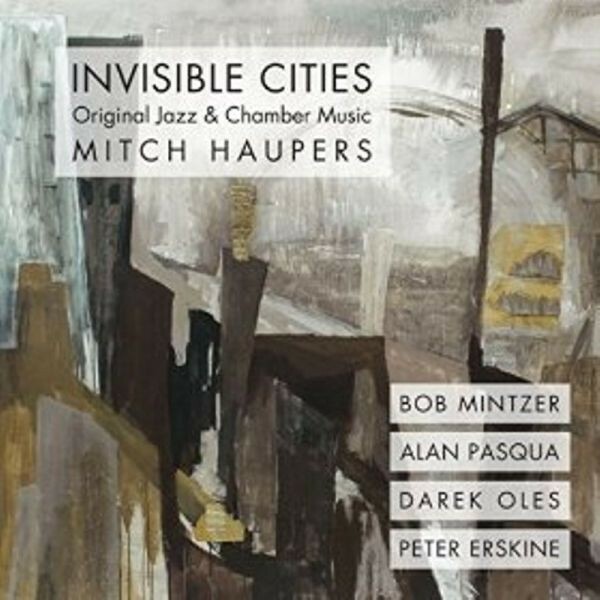 Invisible Cities (Liquid Harmonies Music, 2014) features guitarist/composer Mitch Haupers’ superb, relaxed moods on 11 thoughtful compositions that reveal themselves gradually and gracefully. Produced by Jimmy Haslip and accompanied by pianist Alan Pasqua, bassist Darek “Oles” Oleszkiewicz, drummer Peter Erskine, and saxophonist Bob Mintzer, Haupers wrote all of the songs which were initially conceived as a duet project. As the project evolved his four-movement chamber work for tentet titled “Four Minor Love Songs Suite” became its centerpiece. Part One: “Take Comfort (In Rose’s Garden)” features Haupers playing solo piano accompanied by a dynamic ensemble of strings, woodwinds and brass. Part Two: “The Farmer and The Monarch” features him on electric guitar with the same ensemble. A diverse chamber sextet plays Part Three: “(In Came) Love, So Silent” which also showcases Isabelle Olivier on harp and soprano vocalist Brooke deRosa. Its fourth movement: “Beacon Street” opens up avenues for several guest artists including Jay Mason and Brandon Fields on saxophones, trumpeters Dan Fornero and John Daversa, trombonist Bob McChesney, Russell Ferrante on piano, Jimmy Haslip on electric bass and drummer Peter Erskine to display their virtuosity. Ferrante and Erskine both play great solos on this exceptional movement. The entire suite was orchestrated and arranged by Ayn Inserto. “Veronica’s Lake,” is a composition with two disparate themes that Haupers seamlessly blends in a buoyant 6/4 time signature. Peter Erskine’s drumming swings gently under the harmony of Haupers’ guitar and Bob Mintzer’s tenor saxophone. On “Downtime,” Haupers’ guitar chords take on a warmer tone. Here, pianist Alan Pasqua’s solo is an indication of his depth as an accompanist who can skillfully improvise ideas that later set the tone for Bob Mintzer’s soprano saxophone solo. “Isla Mujeres’ is a ballad arranged by Jimmy Haslip and Mitch Haupers which spotlights Bob Mintzer's chops on tenor saxophone in a style similar to the great Ben Webster. His burnished tones and adept top-to-bottom command of his instrument make this song worth listening to several times. The title track, “Invisible Cities” is also impeccably arranged by Ayn Inserto and is an additional vehicle for Bob Mintzer’s amazing multi-instrumental talents. This song gives Mintzer room to stretch on an array of instruments including flute, alto flute, B-flat clarinet, and bass clarinet. His haunting bass clarinet solo is a sure reminder of Mintzer’s abilities as a soloist and as an accompanist who can really take a composition to another level. Mike Miller’s solo on Brazilian guitar is also very commendable. The program ends with a song for Mitch Haupers’ father titled “Waltz for Bill.” Its beautiful time signature makes this a delightful conclusion to an impeccably crafted program of original songs. Overall, Mitch Haupers’ debut of original jazz and chamber music succeeds as an innovative work with diverse arrangements and skillfully written songs that you are sure to enjoy.